Vladimir Putin: Ladies and gentlemen, friends, good afternoon one more time. It is a pleasure to welcome all my colleagues and friends at another BRICS Summit. Today we are going to discuss the entire range of issues dealing with interaction within our association, coordinate and make new important decisions designed to further raise the authority of our organisation and its influence on the political and economic processes. Russia attaches great significance to the success of this summit and we tried to do everything to make our joint work substantive and fruitful, beneficial for the development of our economies and citizens. Friends, I now give you the floor to make your brief statements. We continue our meeting in expanded format with the participation of our delegations. In line with the agenda, we will have a detailed discussion of the pressing issues pertaining to BRICS activities, primarily in the economic sphere. The organisation's member states play an important role in the global economy. At the end of last year, the BRICS aggregate GDP exceeded $32 trillion, which is a 60 percent growth since the foundation of BRICS accounting for almost 30% of the global GDP. BRICS nations produce a third of the world's industrial products and one half of agricultural goods. We have huge human resources: 43% of the world population - this is an enormous consumer market with a constantly growing demand for modern goods and services. Close economic cooperation ties the BRICS nations closer together. Internal trade is growing - it has gone up by 70% since 2009, while Russia's trade with its member states, for instance, has doubled. Last year, the BRICS economies attracted 20.5% of the world's total direct foreign investment, while in 2009 the number stood at only 16.9%. The share of our countries in capital investment on the global markets has gone up significantly - from 9.7 to 14%. Significant work has been done to strengthen economic cooperation between the BRICS nations. I would like to note that we see this as support from all our partners in this organisation, and I would like to thank you, colleagues, for this. Significant work has been done to implement the resolutions of last year's summit in Fortaleza, Brazil. One of the top achievements was the launch of the BRICS Contingent Reserve Arrangement and the New Development Bank. Our countries have successfully completed the ratification of the relevant agreements. We have approved the procedures for the Contingent Reserve Arrangement bodies and appointed heads of the New Development Bank: Mr Kamath representing India is the bank's President, and vice-presidents from Russia, Brazil, China and South Africa will assist him in his work. The Contingent Reserve Arrangement with a capital of $100 billion will make it possible to timely and adequately respond to financial market fluctuations. The New Bank, in its turn, with a capital of another $100 billion, will implement large-scale development projects in the organisation's member states. We expect to see the first ones launched next year. As we have seen earlier today during the meeting with representatives of the BRICS Business Council, companies from our countries are ready to create joint ventures and enhance mutual investment and trade. Among the documents prepared for approval by the summit is the BRICS Economic Partnership Strategy through 2020. It sets the task of making our economies more competitive on the global markets, strengthening ties in energy, high technology, agriculture, science and education. Russia has also drafted a road map for BRICS investment cooperation. We expect our partners to contribute to it so that we could finalise the document before the end of the year. We had consultations with our business representatives and have already placed some 50 projects and business initiatives on this roadmap. These include proposals to set up an Energy Association, create an International Centre for Energy Studies and a Foundry Union. The joint use of navigation systems, including the Russian GLONASS, opens up broad opportunities. Russian companies are interested in developing cooperation in such areas as production of medical and electronic equipment, software and other. We also propose launching within the framework of this organisation, a mechanism for joint studies of competition and unification of anti-trust regulation, developing closer cooperation on the subjects of labour and employment, population and workforce migration - as I have already said today, I had a detailed discussion on this issue with the leaders of BRICS trade union organisations. They supported Russia's initiative to hold meetings of relevant ministers. Russia considers broader humanitarian cooperation within BRICS of major importance. The Agreement on Cooperation in Culture that our ministers are to sign today aims at further deepening the friendly ties between our peoples. 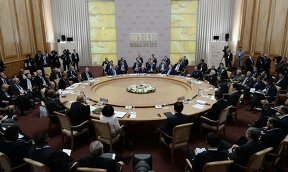 The year of Russia's presidency saw the first meetings of the Civic BRICS, the BRICS Parliamentary and Youth forums. We are working on the issue of creating a BRICS Network University and are analysing the initiative to create a Council of the regions of the BRICS nations. The launch of a ‘virtual secretariat' will contribute to further reinforcement of the organisation's institutional foundations. This modern internet portal will make it possible to further simplify interaction between our countries, while the public will get access to current information on the BRICS activities. These and many other products developed during Russia's Presidency have found their reflection in the Ufa Declaration and Action Plan. These are complex documents that we are to approve at the end of our meeting; they set the key targets not only for the coming year, but for a longer term as well. I would like to thank you for your attention and give the floor to Mr Narendra Mori, Prime Minister of India, the country that will take over the presidency of this organisation next year. Narendra Modi (via interpreter): Thank you very much. 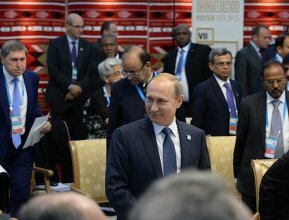 I would like to thank President Putin for the hospitality and the excellent organisation of this event. We appreciate his decision to hold the summit in such a beautiful region, and we would like to express our gratitude to President Dilma Rousseff, who hosted us last year. We have made serious progress, and I thank my colleagues for their support. Some 650 cities in India have been cooperating within BRICS. BRICS can be a beacon of hope in a world of economic and political turmoil and upheaval because our initiatives are not only geared toward the member countries, but also toward the whole world, especially emerging countries. We had very productive discussions in the narrow format and during the working lunch. We are presently faced with serious global challenges and the need to build consensus and cooperation among major countries, and we must adhere to international norms and rules. We are meeting here on the year of the 70th anniversary of the United Nations. This is a landmark year. It is time to take important decisions related to climate change. No matter what challenges we face - social, political, or economic - we will deal with them more effectively if we complete the UN reform - particularly in the UN Security Council - within the approved timeframe. We urgently need to carry out these reforms if we want this global organisation to retain its importance and relevance in the 21st century. Continued socio-economic progress requires maintaining peace and stability. We need to work together to ensure this foundation, to fight terrorism and extremism, and we should speak with one voice to ensure security. We should be united, should not discriminate against anyone, and should talk about sponsors and objectives. We have to work so both within BRICS, the UN Security Council, and the Security Council Committees. We need to work together to eradicate poverty by 2030. We must make sure that this goal is a priority on the development agenda after 2015. We have achieved some impressive objectives in the economic field within the BRICS framework. We have established the New Development Bank, the Contingent Reserve Arrangement, and export credit and innovation project financing processes. There are also proposals on customs cooperation and reinsurance arrangements. The Strategy for BRICS Economic Partnership will be approved today. It is a landmark in the evolution of BRICS. It contains an array of social initiatives. I am delighted that the Indian proposals, which were made at Fortaleza, have been included in this strategy. At our limited attendance meeting, we discussed the economic situation and cooperation between our auditing institutions. I made some proposals on the issue. Climatic conditions are one of the principal challenges today. The BRICS countries should complement one another. We have both the expertise and resources to ensure that renewable energy is used more actively and so that we can provide access to renewable energy sources and energy efficiency technology to all. I would like the New Development Bank also to finance clean energy projects. Ideally, these projects would be implemented by each of our five countries. The BRICS countries should cooperate more closely to adopt the Paris climate agreement this year. We can consider an initiative, within the framework of BRICS, which will propose new solutions in the management, development, social inclusion and empowerment of the people. India will be happy to be on the cutting edge of these efforts. Regarding digital technology, we can make this more effective. We can expand financial and other rights and opportunities for our citizens with the help of digital technology. Youth issues were the focus of our attention last year. The BRICS countries should use their influence to expand the rights and opportunities of women in BRICS countries and around the developing world as a whole. Ladies and gentlemen, we also spoke about migration. On the one hand, migration flows correspond to demographics trends, and we can use them to increase our effectiveness. However, some humanitarian issues provoke conflict, and the UN should take this into account. The BRICS committees and working groups should address this issue and prepare relevant initiatives. We must join forces, because we are all in the same boat. In addition, we should create a BRICS agricultural research centre. Through such a centre, we would have a system for creating more opportunities for investment in agricultural development and assistance to this development, making it so that the countries with a surplus of food supplies could provide food to the countries with shortages, primarily to developing countries. Another major issue for many countries concerns fresh water supply, which is a serious challenge for all of us. We need to share our best experience in supplying water to the public; we have this experience. We can bring about positive change. I think we could hold a forum that could be attended by delegates from local governments. This would give us wonderful opportunities for cooperation over the next few decades. We can learn from each other's experience. Some BRICS countries have outstanding achievements in the world of sports, and we suggest organising BRICS competitions. For example, we could even hold football matches next year. Football is a popular game in the BRICS countries. In conclusion, I'd like to thank President Vladimir Putin once again for this successful summit. I'm sure the unity that all BRICS countries have demonstrated will lead us to new heights and to prosperity. It will be my pleasure to welcome you to India next year. I invite all of you to India for the next BRICS summit. It will be a great honour for me. Before concluding my speech, I'd like to make one more suggestion. We could hold a BRICS film festival - this is what we propose - with special awards; we could promote our format in filmmaking, because cinema is a very important part of culture. This will help us get to know each other better. Thank you, Mr President and everyone here today. Thank you, ladies and gentlemen. Vladimir Putin: Thank your, Mr Prime Minister. Allow me to give the floor to President Xi Jinping of China. Xi Jinping (via interpreter): Esteemed President Putin, Prime Minister Modi, President Zuma, President Rousseff, ladies and gentlemen, friends. I am delighted once again to meet with my colleagues in the beautiful city of Ufa. We thank President Putin and the Russian Government for the excellent preparation of this meeting. Our meeting is once again being held in Russia, six years after the previous one. It is notable for the progress made on cooperation among the BRICS countries during these six years against all odds. The global economy is still recovering from the deep international financial crisis. Instability and uncertainty factors are growing. The risks and challenges faced by emerging markets and developing countries are intensifying. There is a general economic contraction. The BRICS countries, too, have encountered great difficulties and challenges. Nevertheless, we should be all the more confident in the face of difficulties. The BRICS countries have abundant natural and human resources, vast internal markets, a great potential for development and political scope. The rise of the BRICS countries is unstoppable. Colleagues, last year, in Fortaleza, Brazil, we unanimously made the decision to deepen partner-like relations among the BRICS countries in the spirit of openness, inclusion, cooperation and mutual benefit. This year, Russia has also put BRICS partnership at the top of this summit's agenda. Now I'd like to discuss what the partnership between the BRICS countries means. First, it means partnering to maintain peace around the world. Peace and development are powerful driving forces at the present time. However, the world is not calm. Local conflicts erupt here and there. There are recurring security threats such as terrorism and drug trafficking. The BRICS countries should coordinate their actions, support one another, and work together to deal with these global issues. We should work together to prevent terrorism in all its forms, fight it, promote the sharing of antiterrorism experience and information, and cooperation between our law enforcement agencies. The Chinese side wants to speed up the process of eradicating drug trafficking in the BRICS countries and is ready, in conjunction with other member states, to help resolve global and regional issues related to illegal drugs. Forgetting history is an act of treachery. This year, the UN will turn 70, and 70 years ago, victory in the world war against Nazism and fascism was won. The BRICS countries, together with all peace-loving countries and nations, must resolutely oppose any attempts to deny, distort or rewrite the history of World War II. Together we will uphold the results of World War II, international justice and equality. At the same time, it is essential to draw lessons from history, abandon cold war ideology and a zero sum approach, and work together to defend peace and stability in the region and across the world. Second, partnering for the sake of our mutual development. In order to build a chain of values, common interests and a large market where there is a confluence of interests, we need to work together to build closer economic partnership, reveal the complementary advantages of each and every member state when it comes to operating data and operating structure; expand development horizons. At the same time, we must move forward on setting up the New Development Bank headquarters and the Regional Centre in Africa, work to get them open as soon as possible so that we can start seeing results. What are the ways to implement the Strategy for BRICS Economic Partnership and find new areas of overlapping interest? We must continue to contribute to mutual development and the prosperity of developing countries. This year has been designated the Year of International Development and Year of Climate Change. In this context, the BRICS countries must improve their cooperation and protect the common interests of countries with emerging markets and developing countries when working on major initiatives related to the post-2015 international development agenda and climate change. Third, partnering for the development of civilisation diversity. 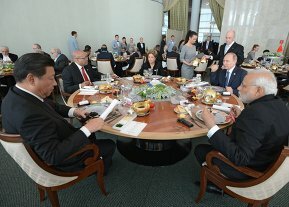 The successful collaboration between the BRICS countries is a remarkable example of how different social orders can coexist, how different models of development may overlap, how different histories and civilisations can borrow the best achievements from each other, how different values and cultures can be in contact with each other. We must maintain openness and tolerance in the process of exchange and borrowing, take what is useful and enrich ourselves with it, and move forward together where we have a shared position while respecting differences. Our countries span four continents and two hemispheres, which creates a special advantage in terms of geography. We should make full use of it and engage in active dialogue and contacts with other countries and international organisations, so that we can all benefit from the results of such cooperation. We must promote cohesion and cooperation in relations with other emerging and developing countries, reinforce our structures and expand the BRICS footprint and influence. Fourth, partnering to improve global economic governance. The rules of the global economy should be subject to timely and regular reforms and updates so that they can adapt to the new environment and changes in global development patterns, striking a balance between responsibilities and capabilities. We must work together to raise the profile of BRICS and enhance its role in global governance. The BRICS countries should strengthen cooperation in information security and internet governance, work together to create a peaceful, safe, open and cooperative cyberspace, and strive to ensure equality in internet governance. Migration issues are closely intertwined with economic development and social stability, which means that we have to step up cooperation in this area as well. Distinguished colleagues, our countries are going through similar stages of development, and face similar opportunities and challenges. There are opportunities for exchanging governance practices, getting to know each other better, assisting each other, learning from one another and finding ways to overcome issues together. China is now consistently and steadily moving towards building a moderately prosperous society, deeper and comprehensive reforms, rule of law in public administration and strict oversight and control within the Party. We have set strategic objectives and devised measures regarding public administration in the new environment as we seek to build a moderately prosperous society. At this stage, our strategic aim is to fulfil our dream of reviving the Chinese nation. We will continue focusing on economic policy as our central objective and will build a moderately prosperous society, in which people will benefit from development and reforms, ensuring comprehensive development in terms of the economy, politics, culture, society and environment. We will be undeterred in our efforts to promote reforms and modernise public governance and capacity building, encourage sustainable and healthy social and economic development. We will continue to improve public administration according to the rule of law, and make sure that the authorities reach out to civil society, laws undergo expert review, the judicial system remains impartial, and laws are universally respected. Colleagues, our current work is not limited to bringing prosperity to the 3 billion people in the BRICS countries, but is relevant for the whole world and all of humanity. As the Russian saying goes, the path to success is thorny and difficult. So let's prepare ourselves for this journey, walk forward hand in hand, build a partnership of the BRICS countries and discover together the great future that awaits us. Thank you for your attention. Vladimir Putin: Thank you, Mr President. Now let me pass the floor to President of the Republic of South Africa Jacob Zuma. Jacob Zuma (via interpreter): Your excellency, President Putin. Your excellency, President Xi. Your excellency, President Rousseff. Your excellency, Prime Minister Modi. Distinguished delegates, ladies and gentlemen. In this historic year of celebrating the 70th anniversary of the end of WWII and the creation of the United Nations, South Africa remains beholden to the important role that the UN played in ending apartheid in South Africa. As South Africans, we also celebrate this year of the 60th anniversary of the adoption of the Freedom Charter, the foundation of our modern constitution of democracy. In the context of peace and security, we have witnessed over the past two decades the emergence of complex new threats that are interconnected, multidimensional and trans-boundary as manifest in phenomena such as international terrorism and transnational organized crime. These new threats have radically challenged the traditional discourse on international law and security. 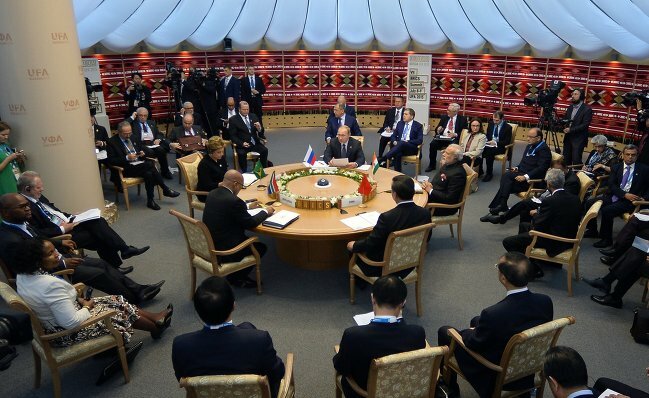 The nature of these threats coupled with resource limitations inspires BRICS partners to work more closely together, notably in the context of the United Nations and relevant regional bodies. Our national security advisors met recently and discussed cooperation on counter-terrorism and violent extremism. Our relevant ministers also discussed the increased use of illegal drugs as a funding mechanism for the former, and I therefore welcome the protocol on anti-drug cooperation that was signed. When we consider that two-thirds of the world's population still does not enjoy access to the internet it should be our shared goal to give people the power to transform their lives and benefit from all positive opportunities that the online would offers. That is, that the world offers. We support the early adoption of rules, norms and principles of responsible behaviour on the internet. We recognise the involvement of all stake holders in terms of the Tunis Agenda 2005 as well as consider the sovereign rights of nation states in this regard. We recognise the need to deal with related crimes through universal regulatory and binding instruments under UN auspices. South Africa was most appreciative of the solidarity we received from our BRICS partners for the recent tragic events in the Mediterranean regarding migrants from the African continent and the Middle East. The South African government is putting various initiatives in place in order to deal with migration issues and we welcome exchanges with our BRICS partners in this regard. We congratulate our chairperson on the successful completion and adoption of the Strategy for the BRICS Economic Partnership which will provide a platform for the further development of our economic cooperation in all identified priority areas. South Africa is eagerly looking forward to working together with our fellow BRICS countries to implement the strategy for the benefit of our people. We also appreciate the recent meetings that our chairperson organized and further encourage our parliamentarians, academics, business people, members of civil societies and youth to continue strengthening their relations and exchanges and acknowledge their contributions. This is indeed a historic year when our intergovernmental agreements on the New Development Bank and the Contingent Reserve Arrangement entered into force. We wish to assure our partners as well as our new president of the bank, Mr Kundapur Vaman Kamath, and his vice presidents, including our own Mr Leslie Maasdorp, of our unwavering support for this endeavour. We also welcome the appointment of the non-executive directors, including our own Tito Mboweni. Since we joined BRICS in Sanya, our trade has expanded exponentially and we have witnessed an impressive growth indicative of the continuous integration of our economies. Both South Africa and the African continent have benefited from our economic cooperation with our BRICS partners. South Africa’s total trade with BRICS in 2011 was 268 billion rand and has since grown to 382 billion rand in 2014, an increase of 70 percent. BRICS’ total trade with Africa has doubled since 2007 to 342 billion US dollars in 2012, and is projected to reach 500 billion US dollars by 2016. In addition to 2015 being the 70th anniversary of the United Nations, it is also a year for a number of significant development processes. These include intergovernmental negotiations on the post-2015 agenda, the Third International Conference on Financing for Development as well as the 2015 Paris Climate Change Conference known as COP21 later this year. As BRICS partners, we must strive to enhance our coordination and coherence on these issues. The overarching triple challenges of poverty, inequality and unemployment continue to inhibit global development. If we, as member states of the United Nations, do not deal comprehensively with the scale of poverty, underdevelopment and disease, the poor of the world will consider that the UN has failed them. Thus, South Africa in its capacity as the current chair of the Group of 77 and China will be working closely with all UN member states towards a global development agenda in which the eradication of poverty and the noble millennium development goals remain our collective focus and are addressed. For BRICS members, the adoption of an ambitious global development agenda will most certainly also provide us with new opportunities for cooperation and will see to the implementation of the agreed on global development goals. I thank you, Your Excellency, Mr Chairman. Vladimir Putin: Mr President Zuma, thank you for your speech. I’d like to give the floor to the President of the Federative Republic of Brazil, Ms Rousseff. Go ahead please. Dilma Rousseff (via interpreter): <…> We believe the new world should be more just, more balanced, and multi-polar. And we should do everything we can to ensure opportunities for sustainable development. The BRICS countries took a big step forward in Fortaleza last year by founding the New Development Bank (NDB). Today’s meeting, which Russia has organised so well, should help us improve our work and facilitate the ratification of the already signed agreements and the drafting of new ones. We’d like the working group consisting of the vice presidents of our countries, or people with similar statuses, to get down to business with a view to ensuring the full-fledged functioning of the NDB. We’d like its Board of Directors to start work in the near future. We must undertake new initiatives to deal with today’s many challenges. We must expand our influence on other countries with rapidly developing economies and the developing nations. At present, the world is going through a fairly difficult financial situation. Investment in infrastructure has decreased substantially over the past year and we must make a special effort to allow our bank to expand its sphere of action, particularly in investment in infrastructure. It must become a key link in the financial structure of the entire world. In other words, we must embark on the practical implementation of our agreements. I’d like to emphasise the need to establish regional centres. Naturally, we should start with what we have planned – the formation of a regional centre in Africa. These affiliates in the emerging financial system will create good conditions for the steady development of the countries of these regions. This would become one of the first regional instruments for facilitating the development of business ties between the economies of various countries and types. A regional centre would also help us learn more about the countries of a given region. But we must hold a series of preparatory activities necessary for developing the agreements that will be concluded between the NDB and the central banks of our countries. The collaboration of a joint strategy for the BRICS economic partnership is also a promising area of our work. We must expand our cooperation to all key economic branches: mining, transport, communications, infrastructure, education, and tourism. We must draft all of our initiatives in accordance with the current economic conditions that are not particularly good at the moment. So we must do all we can in order to develop the right strategy. We must step up our assistance to the developing nations and find new ways of addressing the new challenges of the current global economy. We are aware of the fact that we are nearing the end of the commodities super cycle. We are going through a period of extremely high explosiveness of the modern financial system. I’m confident that the BRICS group will continue to be a driving force for global progress. To do so, we need, of course, to increase our representation in international organisations, including the International Monetary Fund. This should be one of our priorities. We will pursue this goal next year under India’s presidency as well. We should not miss the opportunities that are now open to us. There are lots of challenges and threats we have to overcome on the international stage. There are situations that cause great concern, such as conflicts, wars and other situations that shouldn’t be happening in the 21st century. Every day we learn something new about armed conflicts in the Middle East. Millions of men and women become refugees. The number of refugees in the world today is comparable to the number of refugees during World War II. We are witnessing real tragedies that happen to people who seek refuge and try to survive. Brazil pledged to support and provide shelter to millions of people. The events in North Africa particularly worry us, just like the events in Iraq and Syria, and the ongoing conflict between Israel and Palestine. We know for a fact that armed conflicts or blockades have never been and cannot be successful. All they can do is undermine stability. Supporting religious sectarianism, extremism of any kind, and the spread of nuclear or any other weapons of mass destruction plays similarly negative roles. Brazil wants to help the global community to overcome these threats, and Brazil also wants to help the persecuted religious and ethnic minorities, to help women who are subjected to sexual and other violence. I reiterate: The Brazilian government condemns terrorism as a way to resolve problems. We reject it no matter who participates in these events, or what their motivation is. We also need to act simultaneously and proactively in order to overcome structural problems. 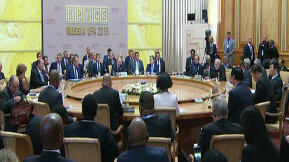 Again, we the BRICS members pledged to fight for the world order to become more equitable and more transparent. Brazil believes that the UN Security Council should be reformed and expanded. Only then can we count on increasing its efficiency in influencing the course of global affairs and promoting collective security. Brazil is open to any and all dialogue within the BRICS, such as on the internet and internet governance, or on countering drug trafficking. Of course, we plan to participate actively in the forthcoming conference on global climate change. We are willing to consider any alternative solutions that may be put forward. But we must also guarantee compliance with the Rio + 20 principle. This group, called the Group of Twenty, should enjoy our full support, and we must help it implement its decisions. We plan to start a new cycle of international cooperation. I’m confident that the initiatives developed by the BRICS will play a crucial role in establishing new constructive international relations. I’m positive that strengthening the BRICS means strengthening the global economy and world peace. Thank you very much. Thank you so much for these interesting and informative reports. I would like to extend special thanks to Prime Minister Modi, President Xi Jinping of the People's Republic of China, President of the Republic of South Africa Mr Zuma and Ms Rousseff. In your remarks you shared your analysis of the ongoing developments in the world and in our countries, and you put forward specific proposals to build up our organisation. If you'll allow me, I'd like to thank all of our colleagues here on your behalf. It is through their efforts and the efforts of their employees and staff that drafted the documents that are being agreed upon and will be signed. I would like to thank you for this part of our work. The next stage of our joint programme today is the signing of a number of documents, following which I will make a statement to the media in my capacity of the head of the host country.